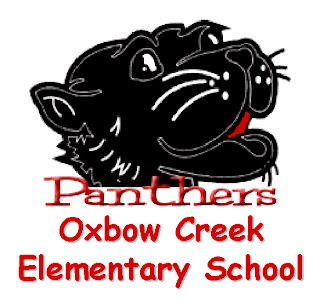 Oxbow Creek Elementary School - New Team Members! When the Oxbow Creek Elementary School kids and student council heard that Neil Eerdmans (a beloved 2nd grade teacher there) is racing in the 2007 Race Across America to raise money and awarness for Camp Odayin, they were enthralled and wanted to join Team Strong Heart's efforts. The student council unanimously set a goal to raise $2,500 for Camp Odayin as their annual community service project. Wow! These kids are incredible! Welcome to Team Strong Heart, Panthers! 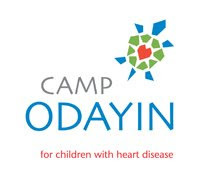 Team Strong Heart would like to express our sincere gratitude for the generous support from Medtronic in our mission to sponsor children, expand programs and generate awareness for Camp Odayin. Welcome aboard! Medtronic is the global leader in medical technology - alleviating pain, restoring health and extending life for millions of people around the world each year. 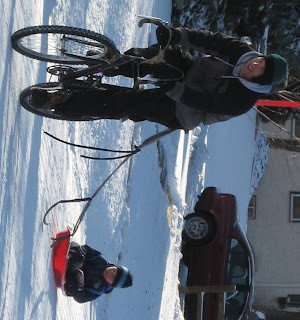 Neil and Owen Bike and Slide! Neil posted this picture and story to his training journal but it was so fun, I just had to pull it out here! Work and training for RAAM is a pretty overwhelming endeavor. We all strive to stay focused on keeping family priority one and finding creative ways to do it is a fun challenge. What a great way to strike that crucial work, training and life balance! Neil, you are B.B.A.! Congenital Cardiology Today - New Sponsor! We'd like to express our sincere gratitude to Congenital Cardiology Today for their support in helping us generate awareness for Camp Odayin. They will be running advertisments in their journal and website. Welcome to Team Strong Heart! HUGE thanks to Mt. Borah/Custom Sublimation for their generous clothing sponsorship! Welcome to Team Strong Heart! Chris Jackson, CEO, has agreed to provide custom jerseys and bib shorts for the racers as well as giving us the opportunity to purchase additional jerseys for resale with proceeds going to Camp Odayin. I'd also like to give special recognition to Karen West-Reger who has been our graphic artist for Team Strong Heart. She's the one who was able to compile the 40 or so drawings that the campers drew at residence camp last summer into our new logo. You've all seen how nice that is. She's now working with Custom Sublimation to design our team jersey and shorts.